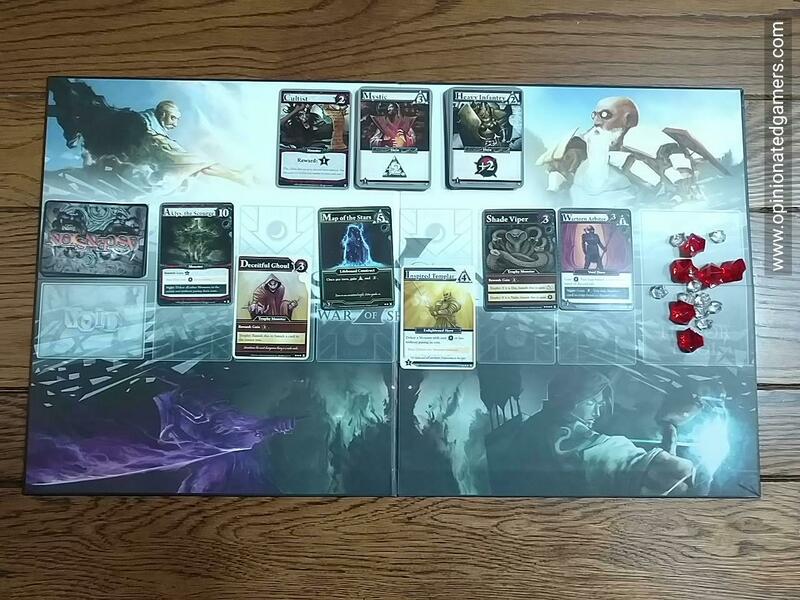 I played the original Ascension when it came out, and while it didn’t grab me at the time – it did introduce a more tactical way to acquire cards; rather than having a static layout on the table, there was a central row of everchanging cards to add to your deck. At the time, it was too much of a change for me, and I’m sad to say that I never went back to explore the system. 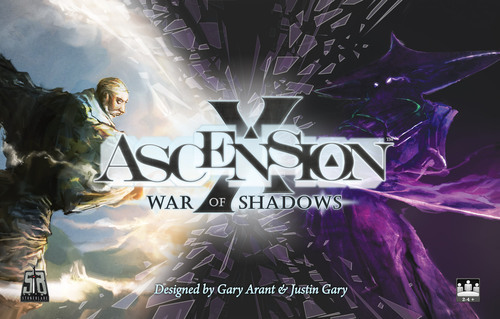 With the newest release, Ascension X – which happens to be the tenth release in the game system – the basic game system remains with a two new tweaks added on to bring new life to the series (Dark/Light cards and dual cost cards). Like most deck builders, players start with a standard deck, filled with basic cards – here you get 8 Apprentice cards and 2 Militia cards. The deck is shuffled, and you draw a hand of 5 cards. The remainder is the start of your draw pile. 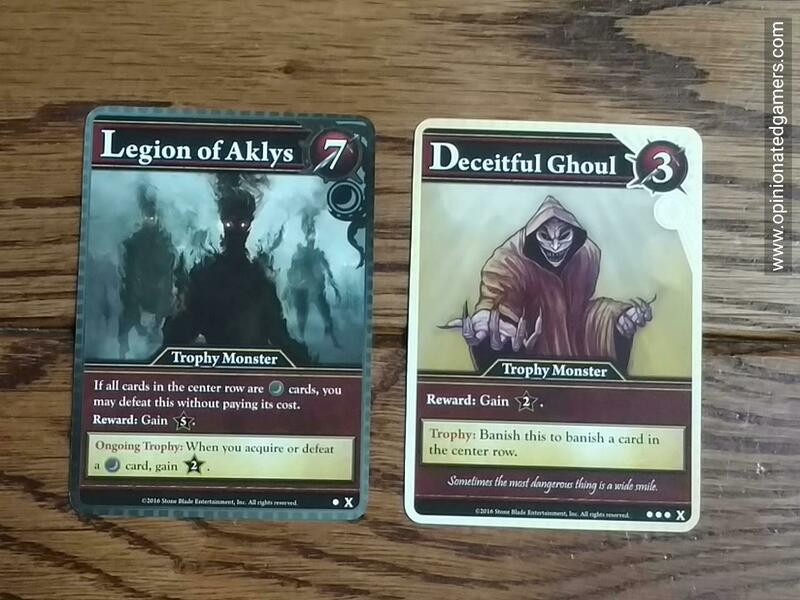 The three “always available” cards (Mystic, Heavy Infantry and Cultist) are placed in individual stacks on the table. The rest of the non-basic cards are shuffled, and a Center Row of 6 cards is dealt out. Finally, 30 Honor Tokens per player are put on the table as a supply. Hero Cards – These cards are typically played from your hand. When you play them, you take the action printed on the card, and then these cards go to your discard pile. Monster – These cards are your enemies; they will appear in Center Row, and when you defeat them, you immediately gain something from the card (Honor points and/or other effects). 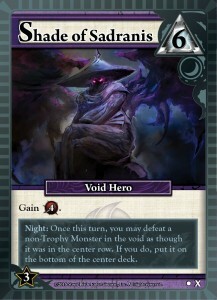 The card then goes to the Void pile, out of the game. Constructs – These represent the things you use in battle. When they are played, they stay in front of you persistently and give their effects until they are destroyed. Trophy Monster – this hybrid Monster is defeated in the usual sense, but when you beat it, you then get to keep the card as a “trophy” – and it stays in front of you until you. Most of them have a one-time use ability, and the Trophy is discarded once its used; though there are a few ongoing Trophies which essentially act like Constructs. So how does a turn go? Again, you start with a handful of cards. You can play them to acquire Runes (white triangle), Power (red circle), and Honor Points (black stars). Keep track of your Runes and Power levels in your hand. Collect Honor Tokens from the table. Then, using your Runes and Power, you can gain Heroes/Constructs (they go to your discard pile) or defeat Monsters from the Center Row. Each time that you gain/defeat a card, refresh the Center Row to 6 cards before doing anything else. All played Hero cards stay in front of you until your turn is over; they move to your discard pile at the end of your turn. Draw a new hand of five cards to get ready for your next turn. Any unspent power and runes are lost at the end of your turn. So – that’s it? Just a paragraph? Well, there’s a bit more than that. One of the extra bits in Ascension X is that the game can now be in Day or Night. Every card in the center row has a day or night icon under the cost. Players total up the Day and Night icons in the Center Row, and if there is more of one than the other – the game is in that state. (If there is a tie, the game is in neither Day or Night.) This is important because many of the cards have conditional effects that come into play if the game is in Day or Night. The state of the game is constantly in flux because each time a card is removed from the Center Row, a new card is added to the tableau, and this might cause the Day/Night status to change. The other new thing in Ascension X are dual costs cards – there are now a few cards that require both Power and Runes to acquire/defeat them. The game goes on until all of the Honor tokens that were placed on the table are acquired. The game is played until the end of the current round so that all players have the same number of turns. There are extra Honor tokens is the box so that players can still collect them. Players now score Honor points for each token they have collected. Also, many cards in the game are worth Honor points – this is denoted in the lower left corner of the card. These points are added to your total. You count all cards in your possession – in your hand, deck, discard pile and on the table in front of you. The player with the most Honor points wins; if there is a tie, the player latest in starting player order is the winner. 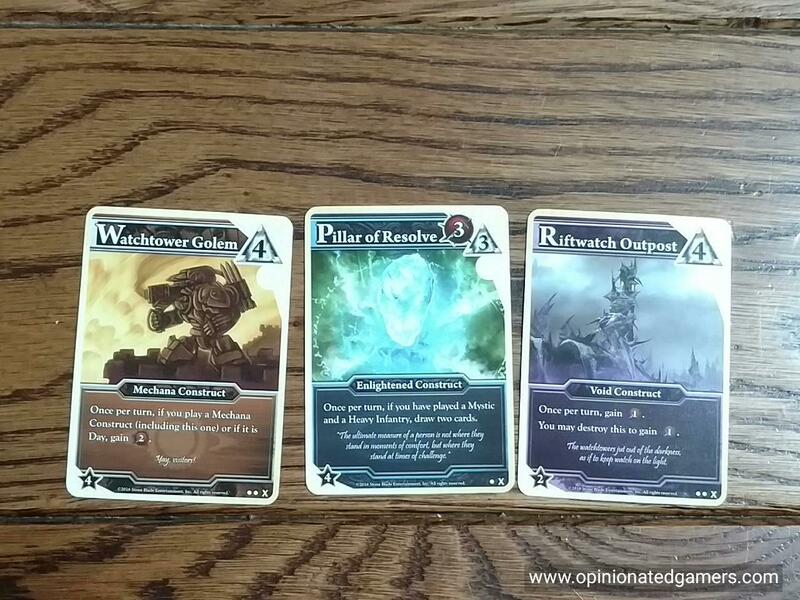 So, Ascension has honestly been off my radar now since the initial release. I think a lot of that was due to the fact that I was a Dominion snob back then. At the time, I preferred the challenge of working within the fixed tableau, and the influence of luck in the constantly changing Center Row in Ascension rubbed me the wrong way. 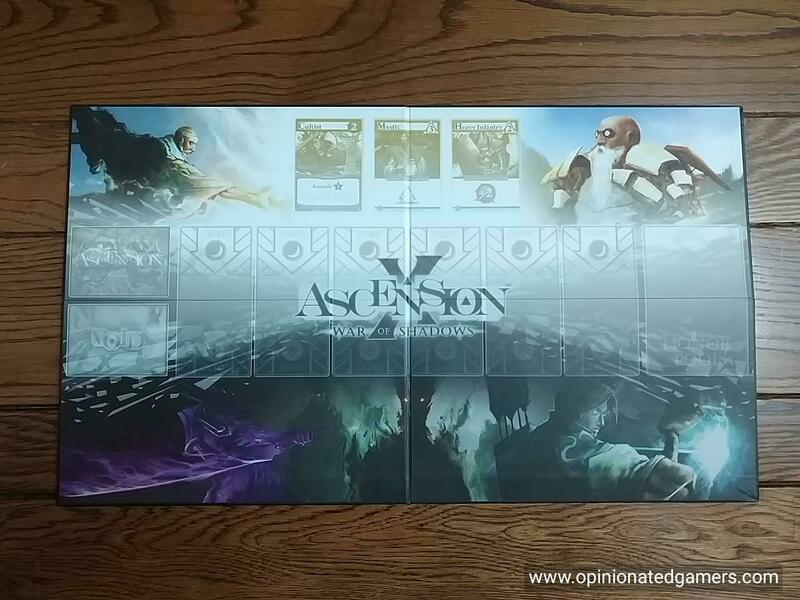 But, over the years, I have played Ascension on my phone and tablet, and it’s a great game to play there, and I was familiar enough with it to take a look at the game at Origins 2016. The latest version of the game is a challenging game, and the additional mechanisms added take a good game and make it a great one. The addition of the Light/Dark cards energizes the Center Row. Strangely (for me, at least), this chance actually accentuates the role of Luck in the game – as now the random layout creating the Day/Night status affects many of the cards in the game. But – this also gives you something else to think about when you are buying and playing cards. Now, you have the added strategic option of trying to buy a card to change the game into Day or Night in order to make your other cards more powerful – or you end up holding off buying a particular card because you don’t want to change the Day/Night status as your opponent has many cards that would benefit. This extra layer of strategy has been very intriguing, and it definitely makes the game feel more complete. 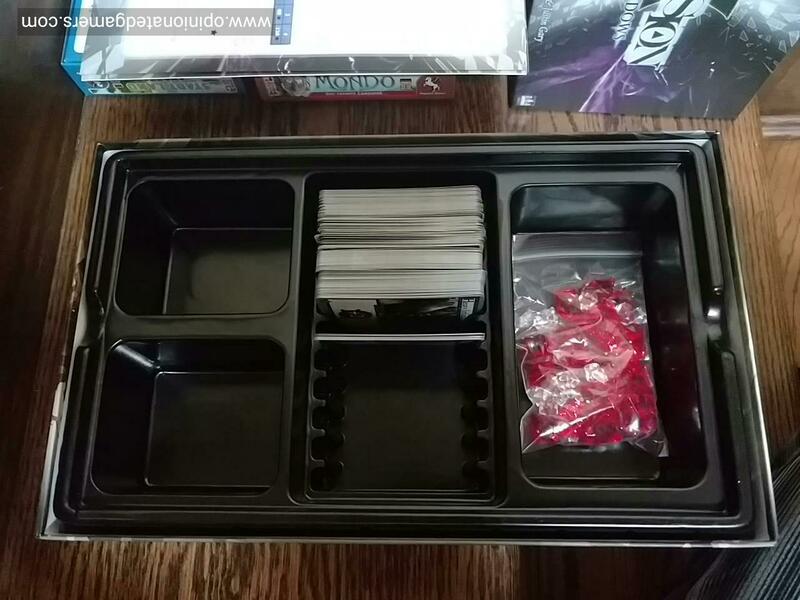 The core of the game is still making the best of the Center Row when your turn comes up, but the added tweaks to the game give you so much more to think about. After ten sets, Ascension is not just producing “more of the same”, but growing and evolving the game for years to come. Fraser: We have the physical first two sets and a few promos/expansions, but I long ago decided to only play this on my iPad. The only time I would be tempted to play the physical version would be as a teaching game. When playing with a bunch of sets you can play one card and it may activate special features on four others, change the cost of some of the cards in the centre etc. etc. The electronic version keeps track everything for you, if I was playing the same decks with the physical version it would be too easy to lose track of what was going on. A perfect electronic game to play solo or with someone else anywhere else in the world (I much prefer two player, but do have a few three player games on the go with somebody in the USA and someone else in Scotland). So for me, I will wait for the electronic version of this deck to come out.